Remember when movies could be nationwide cultural events? Maybe it’s the “Get off my lawn!” in me, but it feels like our culture has become so fractured that, aside from perhaps a new superhero or Star Wars release, few films tear through our national psyche and leave touchstones in their wake. 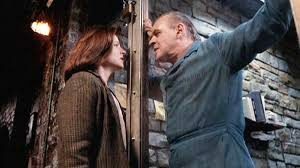 “When Jonathan Demme’s The Silence of the Lambs opened in theaters on Valentine’s Day 1991, it was clearly one of those rare movies that are at once of their moment and ahead of their time. Many years later, it remains both of those things.” Okay, to be fair, many Best Picture winners don’t dent our national psyche the way this movie did, so maybe the kids can hang on my lawn. If you haven’t seen this film, I urge you to do so now. Drop whatever you’re doing – flee your kid’s Little League game, quit your job, leave your wife in the middle of giving birth – and watch it. Then come back and join us for a discussion of the bonus features found on this new double-disc Blu-ray edition from Criterion. Criterion originally released The Silence of the Lambs on laserdisc in the mid-90s and then put out a DVD in 1998. Both editions had, among other things, a commentary track with director Jonathan Demme, Jodie Foster, Anthony Hopkins, screenwriter Ted Tally, and former FBI agent John Douglas. They were recorded separately, which was a smart move because it keeps the proceedings moving at a fast pace and ensures that there’s a constant flow of information. It’s always been a highly regarded track that never found its way into subsequent home video releases from MGM, which caused that 1998 Criterion DVD to jump in value on eBay. Fans will appreciate its inclusion here, especially the ones who resisted paying exorbitant prices for the earlier Criterion disc. An 18-minute interview with film critic Maitland McDonagh, who talks about not only Hopkins’ seminal interpretation of Dr. Hannibal Lecter but also Mads Mikkelsen’s version on the Hannibal TV series. She also puts the character in the context of serial killers from film history, including as far back as Fritz Lang’s M.
A big batch of deleted material running 38 minutes total. While some of it was previously available, there’s much more than was found in prior home video releases. Much of it is comprised of alternate takes and little moments trimmed from scenes, so there’s nothing that screams “This should have been left in the film,” but it’s still interesting to watch. It concludes with three minutes of bloopers that help take the edge off. Page to Screen (42 minutes): This 2002 episode from a Bravo TV series examines the movie’s journey from Thomas Harris’s novel to Ted Tally’s script. Peter Gallagher hosts the proceedings, which includes interviews with Tally, aforementioned former FBI agent John Douglas, and others. Harris, who is notoriously reclusive, does not appear, but Gene Hackman does pop in briefly to talk about his original involvement with the film. Inside the Labyrinth (67 minutes): This tenth anniversary documentary features Taubin, Demme, Foster, Hopkins, Tally, producer Ron Bozman, studio executive Mike Medavoy (from now-defunct Orion Pictures), and others looking back on the film. Demme was a protégé of Roger Corman, who has a cameo in Silence and shows up here to talk about it. Jonathan Demme and Jodie Foster (53 minutes): Created by Laurent Bouzereau, who has put together some great documentaries about classic films, this is a beginning-to-end look at the making of the movie, complete with some interesting bits of trivia. Imagine a version of The Silence of the Lambs with Michelle Pfeiffer and Sean Connery. Now try to un-imagine it. Scoring “The Silence” (16 minutes): Composer Howard Shore talks about his approach to scoring the film and how he used the music to complement what was happening on screen. Behind the Scenes Featurette (9 minutes): This is one of those featurettes that were created way back when to hype movies for theater owners without really delving too deep into them. It’s worth watching as an historical artifact, though. Storyboards (5 minutes): This includes a big batch of storyboards with musical accompaniment. The standard-issue Criterion booklet included here has the aforementioned Taubin essay as well as Thomas Harris’s introductions for new printings of The Silence of the Lambs and Red Dragon and an interview with Jonathan Demme published in Film Comment in January 1991, just as the movie was about to premiere. There’s also an introduction written by Jodie Foster last November.